Minneapolis, Minnesota: Bionic Pet Products is proud to announce the latest addition to their popular line of ultra-tough dog toys with the new Urban Stick. This toy was designed for throwing and fetching, and is specifically formulated to handle the most aggressive chewing and playing. Bionic’s unique design keeps dogs engaged and will make games of fetch last much longer. The toy’s weighted ends create a spiral motion and is great for medium distance throwing. Contoured ridges create a grip for effortless throwing and an uneven surface that dogs love to chew on. In addition to being a great throw toy, the Urban Stick is also an ultra durable chew toy, and can be used as a tug toy. The toy’s open center can be stuffed with treats when it’s time to give your dog a much-deserved reward. Available in four sizes, the Urban Stick is ergonomically shaped for each dog’s bite and strength. By creating four specifically designed variations of the new toy, instead of just scaling the toy to various sizes, Bionic ensures the highest level of durability for a wide range of dog sizes. Like the rest of Bionic line, the Urban Stick comes in an easy to see bright orange color, floats, and is dishwasher safe. All of Bionic’s toys, including the Urban Stick, are made from FDA Food Grade materials that are non-toxic and meet the quality standards their customers have come expect. 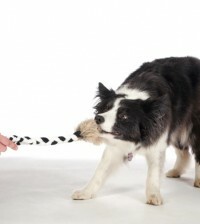 Since Bionic’s toys debuted in November 2011 they have earned a reputation as the most durable dog toys available around the world. 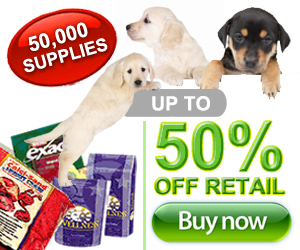 They gained this reputation by creating a product that fewer than 5% of dogs can outsmart. The secret lies with the Bionic Rubber material, which has three dimensionally inter-woven molecules that creates superior strength and durability. Dogs and dog owners have come to love Bionic toys because they are bouncy, flexible and nearly puncture proof. 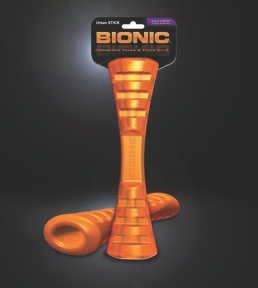 Bionic leads the pack for durability while other toys can feel like a dime a dozen. For more information, contact Steve Luhrs at 952-927-2220. 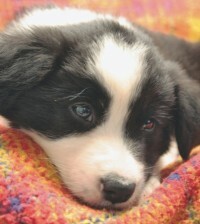 Email: sluhrs@bionicplay.com Bionic Pet Products, 1100 Xenium Lane North, Plymouth, Minnesota 55441. *Bionic Rubber® is non-toxic, FDA food-grade material that is safe for your pet. It does not contain any harmful phthalates, hormones, lead, cadmium, mercury, natural rubber, Bisphenol A, asbestos or latex. It is 100 percent recyclable allowing us to produce no waste when we manufacture our Bionic Play products.